For many people, filing a Bankruptcy is the last thing they ever wanted to do. In fact, they probably never imagined that they would have ended up needing to file a Bankruptcy.They had always planned to pay their debts. They are the hard working American people. The key word is “need”. When you have tried everything else and still can’t fix your financial life, a Bankruptcy is a wonderful relief. Maybe some unexpected life event has taken place such as medical bills, divorce, loss of job or any myriad of circumstances. What if your business partner steals all the money in your business bank accounts and flies off to Tahiti? What if your album sales slow down and you can no longer afford to pay your tiger handlers and at the same time pay the employees who run the roller coaster and the carousel? Or if your child support gets raised and you can’t pay your credit cards anymore? If that is the case, that you find yourself needing to file a Bankruptcy, then there is no reason to feel bad for having to file. You will find yourself in good company! Here is a partial list of some of the famous and important members of the history that have had to do just that, file a Bankruptcy. Just seeing Walt Disney on the list, isn’t it a comfort to realize that filing a Bankruptcy didn’t put a stop to everything in his life, on the contrary, what a legacy he left to the whole world! Historical figures that changed the world such as Walt Disney, Wolfgang Amadeus Mozart, Oscar Wilde, Mark Twain, PT Barnum, Milton Hershey. Celebrities such as Larry King, Anna Nicole Smith, Gary Busey, Kim Bassinger, Mickey Rooney, Debbie Reynolds, Burt Reynolds, Don Johnson. Worldclass Singers such as Michael Jackson, M C Hammer, Dionne Warwick, Wayne Newton, Cyndi Lauper, Tammy Wynette, Willie Nelson, Mick Fleetwood, Wayne Newton, Merle Haggard. Sports figures Mike Tyson, Dorothy Hamill, Tony Gwynn. Presidents of the United States Abraham Lincoln, Thomas Jefferson, and World renown businessman (who some excepted to run for President) Donald Trump. Trump didn’t personally file, but four of the companies that bear his name filed. He understands business, and he understood it was necessary in order to be able to rebuild. Of course if we are doing something unreasonable that makes us end up having to file, then we might feel bad that we didn’t change our life style and prevent it in time. An example would be Michael Jackson who filed because it was taking $10 Million dollars a month to run his Neverland Ranch. Is it really necessary to maintain a lifestyle that requires that much money per month? Wouldn’t it be possible to scale back and prevent having to file ahead of time? But Don’t Do Something Stupid Either! 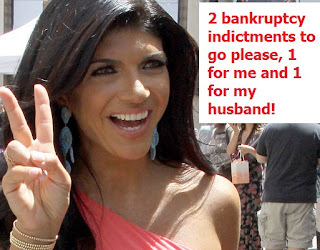 (Reality TV Show Real Housewives of New Jersey) and her husband Joe are in plenty of hot water with the Bankruptcy Court, they are accused of hiding major assets and lying on their bankruptcy petition. Of course, at this point, we cannot say that they did lie, only that they’re accused of it. They are facing more than 50 years in federal prison, and not the club fed version of it where we send regular white collar criminals and politicians. Additionally they face Millions in fines. They have pleaded not guilty to charges of Fraud. That would be the moment when lying about the lavish lifestyle doesn’t make the fraud worth the time in court, the hassle, or prison. If convicted you are not able to discharge your debts. This doesn’t mean your case is dismissed, you will still be turning over your property to the Trustee so the stuff you own can be auctioned off. And you can’t discharge your debts in future bankruptcies either. There is a big sign in the hearing room with the reminder that you are under penalty of perjury, you need to be telling the truth, and that the penalty for making a false statement or concealing property is a fine of up to $500,000 or imprisonment for up to five years, or both. This entry was posted in Uncategorized and tagged 45 famous celebrity bankruptcies, celebrity bankruptcy, entrepreneur bankruptcy, famous bankruptcy, murrieta bankruptcy, murrieta bankruptcy attorney, murrieta bankruptcy lawyer. Bookmark the permalink.